There are seven native types of swallows found in North America. Swallows are common throughout the continent. The Barn Swallow, Bank Swallow, Cliff Swallow and Tree Swallow can be seen from the Atlantic coast to the Pacific coast and into northern Canada and Alaska. The Northern Rough-winged Swallow is seen throughout the USA and all of the southern provinces of Canada. The Violet-green Swallow has a range on the western coast, from Alaska to Mexico and along the Rocky Mountains. The Cave Swallow has the smallest range and can be found along the southern perimeters of New Mexico and Texas with a small colony in southern Florida. The Bahama Swallow is a vagrant swallow and is sometimes seen in the southern regions of Florida. The swallows feed on insects and these acrobatic birds catch their prey as they manoeuvre through the air. They are mostly found near water and most swallow species build their nests from mud. 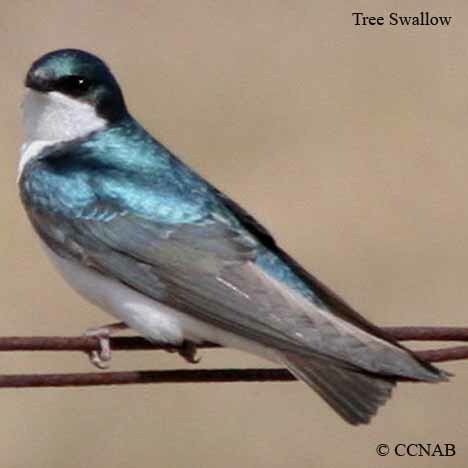 The exception to this is the Bank Swallow, who prefers to burrow into the sides of sandbanks and the Tree Swallow and Violet-green Swallow, prefer to nest in the cavities of trees and posts and they use man-made birdhouses when given the opportunity.